Michigan hosts Iowa this evening (7:00 p.m., ESPN) in search of a quality victory to bolster its NCAA tournament hopes. The Wolverines have fared well against the Hawkeyes at home, but will be facing one of the tallest teams in the country. Michigan hosts Iowa this evening in hopes of keeping its slim NCAA tournament hopes alive. The Hawkeyes have lost three games in a row, but would still be the highest rated team that Michigan has beaten all season. It wouldn’t quite be a top-50 win (Iowa’s RPI checks in at 51), but it certainly could be by season’s end. The good news for John Beilein and his staff is that Michigan has been significantly better at home against the Hawkeyes than in Iowa City. Michigan has won its last five home games against Iowa by an average of 15.8 points per game. Over that same stretch, the Wolverines are 2-3 at Carver-Hawkeye Arena with an average Iowa margin of victory of 7.8 points. Iowa has been a terrible matchup on the road, but one that Michigan has won comfortably at home, even last season with Derrick Walton sidelined and Spike Albrecht running the show. Iowa touts the league’s No. 4 offense, scoring 1.10 points per possession, thanks to its ability to crash the offensive glass and get to the free throw line. The Hawkeyes are rebounding 36.6% of their missed shots while attempting 51 free throws per 100 shot attempts — both figures are best in the league. The free throws and second chances mask an offense that isn’t very good at actually shooting the ball. The Hawkeyes are shooting 48.2% on twos (9th) and 33.9% on threes (10th) for a 49 eFG% (9th) in Big Ten games. Only 29.6% of Iowa’s shot attempts are from three-point range (3rd fewest in the league) and a Big Ten-best 26.6% of their points come at the free throw line. Iowa is also the fifth tallest team in the country according to average height and KenPom’s ‘effective height’ metric. The Iowa starting lineup goes 6-2, 6-5, 6-9, 6-9, 7-1 with 6-2, 6-6, 6-8 and 6-10 options off the bench in the primary rotation. Given their height, the Hawkeyes do have one of the better post-up offenses in the conference, averaging .99 points per post-up, but only 10% of their offensive possessions are in the post or shots resulting out of post pass-outs. Despite the fact that the Hawkeyes have many of the traits you would expect in a good defensive team (height, offensive rebounding, experience), Iowa’s defense has been shredded in Big Ten play. The Hawkeyes are surrendering 1.18 points per trip while allowing opponents to shoot 51% on twos and 35% on threes. The league-worst defense is paired with league-worst defensive rebounding as Big Ten opponents have grabbed 36% of their misses. Hawkeye opponents are shooting 51% on twos (13th) and 35.2% on threes (10th) in Big Ten games for a 51.7 eFG% (11th). 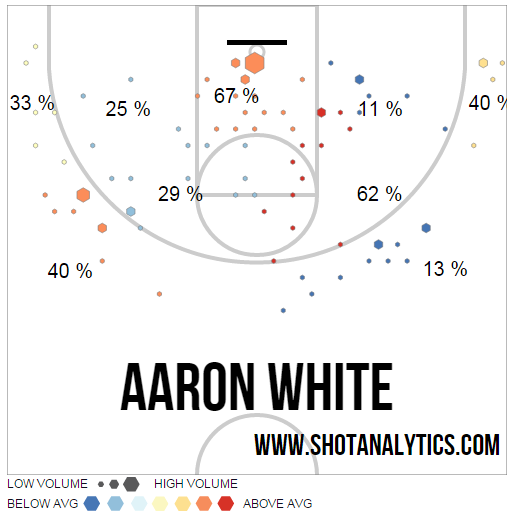 It feels like Aaron White has been around the Big Ten forever now and the 6-foot-9 senior is having the best season of his career. He’s using 24% of Iowa’s offensive possessions with a 125.5 offensive rating while shooting 57% on twos and 29% on threes. There are two keys to stopping White: a) don’t foul him b) keep him out of transition. White scores 1.4 points per transition possession, good for the 90th percentile nationally, and has already scored 102 points in transition — one of the best marks in the Big Ten. He also attempts a ridiculous 89 free throws per 100 field goal attempts, the best free throw rate for a Big Ten player in years (his sophomore year FTR of 86% is the next best in the KenPom era). In conference play, he’s attempted more free throws than field goals. White is joined on the wing by another 6-foot-9 forward, Jarrod Uthoff. Uthoff leads Iowa in three-point makes (33 of 89, 37%), but is shooting only 42% on twos. He’s also an above-average shot blocker. 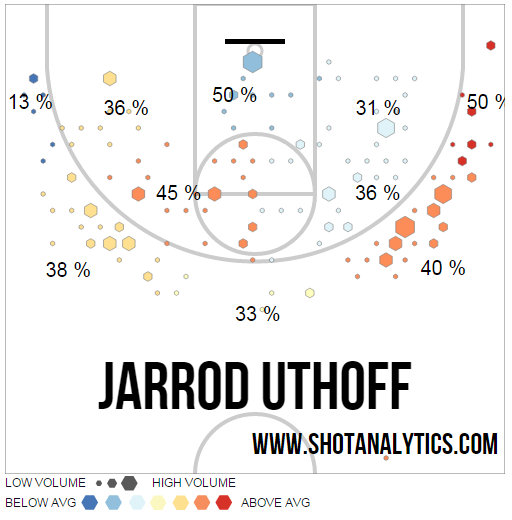 Uthoff is the only Iowa player to have made more than seven three-pointers in Big Ten games this season at 13 of 36. (For comparison, five Wolverines have made at least 7 threes in Big Ten games this season). Whether it’s poking people in the eyes or cheating on jumpballs, Adam Woodbury’s reputation as one of the sneakiest (and potentially dirtiest) players in the Big Ten grows by the day. Woodbury’s offensive numbers have regressed this season, but his defensive rebounding has improved. The 7-foot-1 center is shooting on 59% on twos this season while averaging 6.9 points and 5.4 rebounds per game. Woodbury splits frontcourt minutes with Gabriel Olaseni, and the 6-foot-10 big man has better peripheral statistics than Woodbury almost acorss the board. He’s a better offensive rebounder, better shot blocker, shoots 55% on twos, draws more fouls, makes a better percentage of his free throws and is only a slightly worse defensive rebounder. 6-foot-2 juniors Mike Gesell and Anthony Clemmons are Iowa’s primary ballhandlers and lead guards. Gessell is the much better distributor with a 31% assist rate, but he shoots just 44% on twos and 29% on threes. Clemmons is the better shooter, 43% on twos and 36% on threes, but has also struggled with turnovers at times. 6-foot-6 wing Peter Jok stepped into the starting lineup in mid-December, but hasn’t been the most efficient offensive player. He’s shooting 33% on twos and 33% on threes in Big Ten games and the majority of his offense comes off of spot up possessions or screens. He leads the Hawkeyes in steal rate in Big Ten play, but isn’t much of a creator. Senior guard Josh Oglesby uses just 8.8% of Iowa’s offensive possessions and isn’t shooting the ball well, but still plays like a shooter. He’s shooting only 31% on threes this season and is a career 32% three-point shooter, but he’s attempted 420 threes over the last four years. Avoid foul trouble: Iowa is just 5-6 when it manages a free throw rate under 42% and Michigan is among the country’s best at not fouling. Playing at home and playing a lot of zone, Michigan should be well-equipped to play a clean game and prevent the Hawkeyes from scoring the easy points at the line that they are accustomed to. Given Iowa’s spotty shooting, average zone offense (55th percentile) and ability to get to the line, expect Michigan to stick with its 2-3 zone quite a bit this evening. Clean up the defensive glass: While avoiding fouls is one of Michigan’s core values defensively, it would be a bit of a stretch to call defensive rebounding a Michigan strength. The Wolverines are ranked 8th in Big Ten games in defensive rebounding rate and have been inconsistent on that end of the floor. Iowa will have a size advantage in the frontcourt with Zak Irvin and Aubrey Dawkins checking Iowa’s 6-9 wings and Ricky Doyle and Max Bielfeldt checking its 7-footers in the paint. Get the offense clicking: Michigan’s offense has shown signs of life recently and facing the worst defense in the Big Ten should be an opportunity to keep up that momentum. Spike Albrecht’s ability to run the offense and create some easy opportunities against a sub-par defense could be the key for the Wolverines in this one. KenPom projects this as a 62-60 Michigan victory, giving the Wolverines a 56% chance of defending their home floor. This is close to a must win for any realistic scenario for Michigan to make the NCAA tournament and according to KenPom this is the most likely victory of any of Michigan’s next six games.